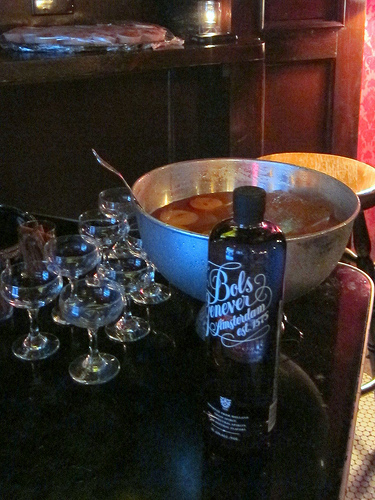 Last Fall, I attended the National Punch Day crawl with Bols Genever. We hit four bars and had some nibbles along the way. 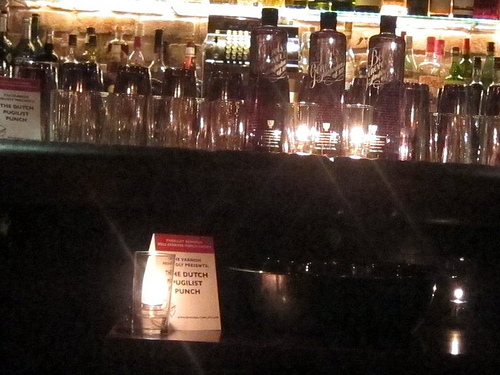 When I saw Thrillist was doing a punch crawl with Bols Genever, I cleared my calendar and invited some friends along. For $25, we were going to 6 bars and it included some nibbles as well. It was a great deal. 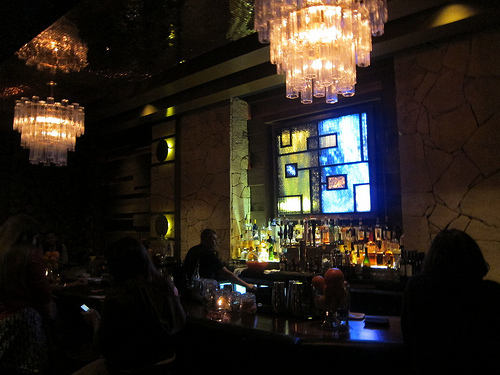 The crawl would include Cole’s, Varnish, The Falls, Drago Centro, Bar | Kitchen and Cana. 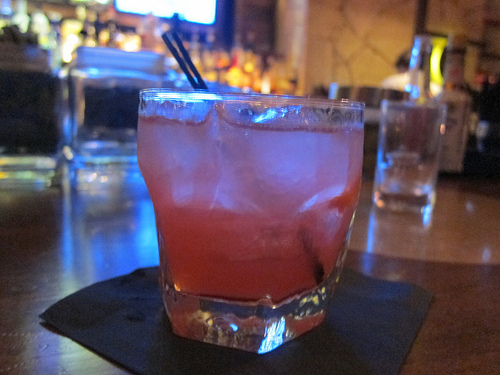 I hit the bars in that order and started the night off right with Cole’s Peach Cobbler Punch. Bols Genever Ambassador Marcos Tello of the Varnish welcomed me straightaway as a previous crawler (survivor?). The Peach Cobbler Punch was served with a bite of peach cobbler as well. I also went for a lamb dip and since it was still happy hour, had another cocktail, Cole’s A Red Car Named Desire as I waited for friends. 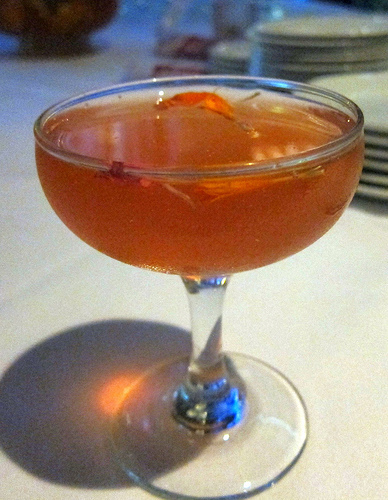 A Red Car Named Desire was my sort of cocktail (rye, Cynar, Luxardo, Maurin liqueur). 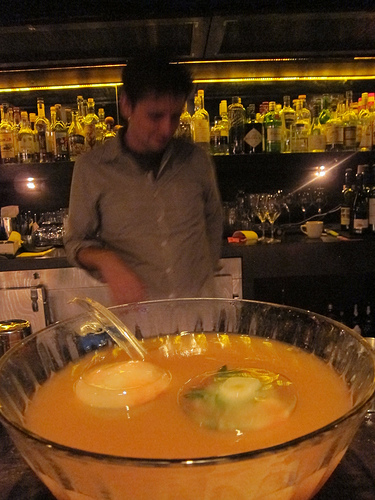 When the crew was assembled, we went into the Varnish where bar manager Chris Bostick welcomed us with the Dutch Pugilist Punch. There was an etymology lesson behind the word pugilist. A pugilist is a boxer, one who punches. So, this could be called a punch’s punch! I found this punch quite complex but perhaps a bit warm. No matter, we were on our way to the next stop. As much as I would have liked to have lingered in one of DTLA’s best bars (I can’t believe I didn’t order my fave Chris drink there- the Safety Word! ), we had a schedule to keep. I was an alcoholic taskmaster this evening. We headed up the street to the Falls where we had the Flowing Bols. We asked what was in the Flowing Bols and it turned out to be quite a few fresh fruit juices including pineapple and lime. Very tropical! Next we headed over to one of my favorite restaurants, Drago Centro. 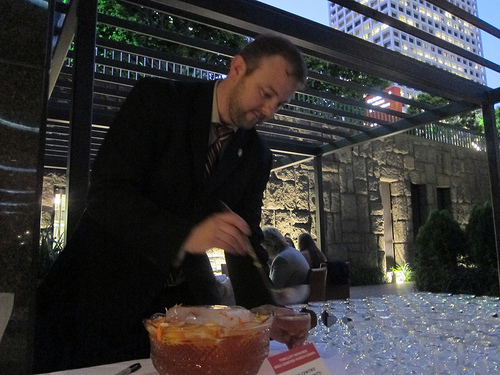 I joked with sommelier Michael Shearin about the huge block of ice for the tiny punch bowl but it was by far the prettiest punch bowl with fresh flower petals. 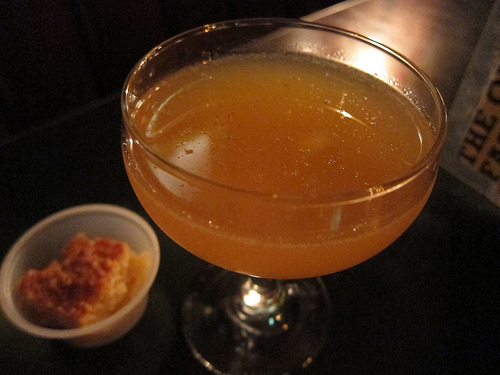 Drago Centro served their Pompeii punch with pizza. I wish I had more time to eat but we were starting to slip behind schedule again (probably because I was drinking one of my fave cocktails there, the American Graffiti) and I rushed everyone over to Bar Kitchen. I’ll be back soon to Drago Centro soon (like tomorrow!). At the fifth bar, Bar | Kitchen, we oohed and ahhed the floating ice cubes. Charlie said he made them in hollowed out grapefruit halves. BK was packed with punch revelers and self-described Booze Nerds who were out in force welcoming PDX bartender Jacob Grier who was in town. Coincidentally he’s also a Bols Genever Ambassador like Marcos Tello. Vondelpark is one of Amsterdam’s largest parks. 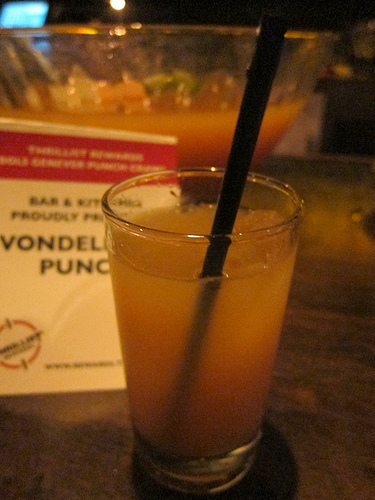 It was fitting this Vondelpark Punch was a botanical wonder. 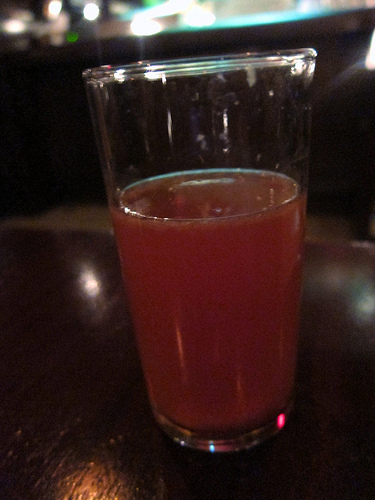 I seemed to be chasing punch though with other cocktails and enjoyed Charlie’s Old Pal (rye, Campari, vermouth). BK served up bacon-wrapped dates with the punch. 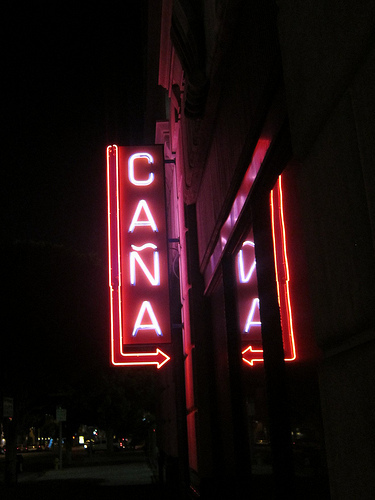 Oh hey, we made it to the last bar, Cana! As I slid onto my favorite barstool (the corner barstool! 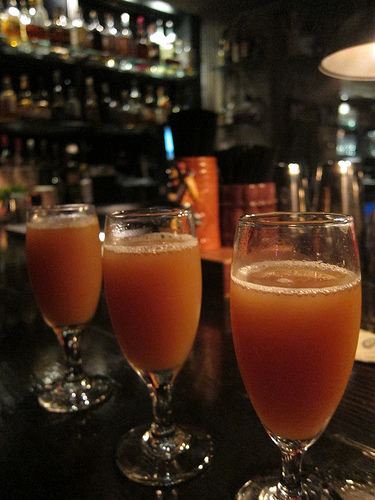 ), we were given the Panamanian Detective punch. I detected guava in the Panamanian Detective (I did not say I wasn’t cheesy). The sugar was starting to get to me even though I was careful to chase every drink with water (and maybe, sometimes other cocktails). There may have been one or two other cocktails after this including the Azteca de Oro and a simple (but delicious) Rye Bulleit Old Fashioned. I definitely loved this Thrillist Awards and had so much fun on this crawl. I can’t wait for the next one. I hear craft beer crawls are in the works. Let’s hear it also for Bols Genever! A very versatile spirit and sometimes makes me turn my head away from my cherished whiskey. ** I’m working on getting the punch recipes. Ahah this looked like such an amazing event + I’m amazed you documented it so well considering the number of cocktails you consumed. The sign of a true blogger :-). Hahah, I have a memory for booze! It was so much fun! You should try to go to the next one, whenever that will be. Good to see you on this crawl!